Toronto has launched a unique website that could change how residents decide where to live, how charities decide where to operate, and how politicians decide where to spend taxpayers’ money. The Wellbeing Toronto website provides easy access to a treasure trove of neighbourhood-by-neighbourhood data that is currently inaccessible or accessible only with difficulty. 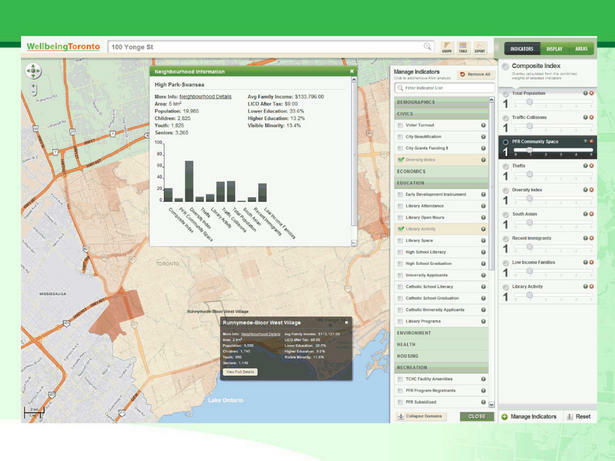 It includes an unprecedented gizmo that allows users to rank the city’s 140 official neighbourhoods by dozens of criteria related to crime, safety, the economy, health, education, housing, the environment, demographics and civic participation. >>See the full article in the Toronto Star.